WOW have I ever been busy! It has been a difficult month for me, and finally things are slowing down. So several housekeeping tasks need to occur. First, an apology to the last two monthly winners on my BOM contest. Your prize packs have not been sent and I am grossly negligent and repentant about that. I am going on a much deserved vacation next week and when I get home your prize packs will FINALLY go in the mail. Second duty is to pick a winner for the month of April. All I was able to manage last month was to post the BOM but just didn't have a chance to pick a winner. So the winner for April is. . . . .
Congratulations! I will prize packs in the mail to all three of the past winners the first week of June. Email me with your snail mail address please, so I can send you your prize pack. So what has had me in such a dither? I have been traveling a lot to do guild presentations and my local quilt show, where I chaired the mini quilt auction. I am SO not good with $$ and it took me and the treasurer two weeks to get it all worked out and the money distributed to the appropriate charities. If I do this again next year SOMEONE ELSE will take care of the $$. The end of the Academic year was another all-consuming event. Final exams, grades, assessment reports and planning a summer four-week professional development program has turned those 40 hour weeks into 60 hour weeks. Yikes, I had not idea that being responsible and doing all the things I am supposed to be doing -- on time -- was so difficult!!! LOL Add in a few frustrating and goofy trials that can only come from working for the federal government, and it has been a recipe for stress. Well anyway, I am looking forward to my almost two weeks off! I am going back to Ohio for my college reunion. We camp over Memorial Day weekend every year and this is year #35. 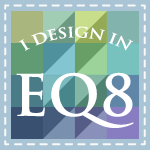 I made the flag to celebrate 35 years of fun in the sun on the Mohican River and here is the EQ7 illustration. I will be making it in the truck on the drive from Kansas to Ohio! Can you see "Mohican" spelled out in the flamingo's legs? The flamingo is the mascot of our Mohican campout. Of course we always go tubing down the river so I had to put a tube in there. The bucket of wine bottles is for the traditional wine tasting that occurs every year. And I had a special request by one of my friends to put in a can of Rolling Rock beer since it is his favorite. Of course I had to do that! So now we are packing the trailer and getting ready to leave in a day or two. I am so looking forward to this trip as it is all about relaxation, friends and family after the past few months of work, travel, and stress. Ahhhhhhh, I can almost see the river through the Hocking Hills of south central Ohio. Oh, and before I go, I will post the next BOM a bit early so it will be there for the first of June. Here is block 6 - Golden Jubilee. You can find the download on the BOM page. Have fun. 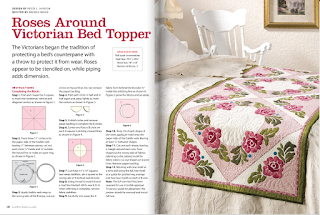 Roses Bed Runner pattern in print! This month another pattern appeared in print! 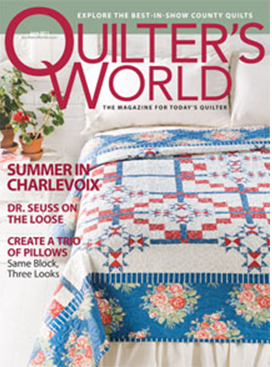 The June 2011 issue of Quilter's World features my Victorian Roses Bed Runner pattern. 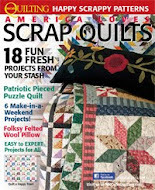 No, I didn't make the cover this month -- that was sort of a once in a lifetime thing -- but they did do a nice job featuring and illustrating the pattern. This is the cover of this month's (June) issue of Quilter's World magazine. 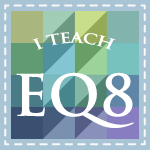 And this is my EQ7 drawing of the pattern. 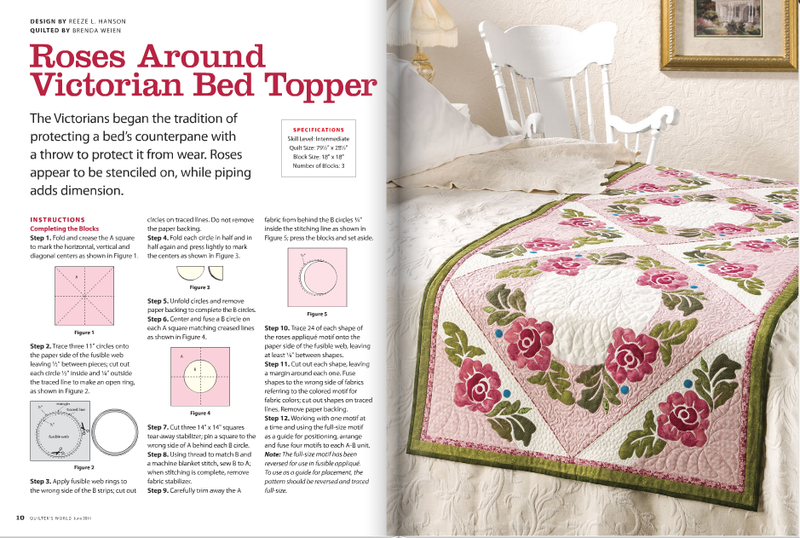 Here is the illustration from the magazine of the actual quilt. 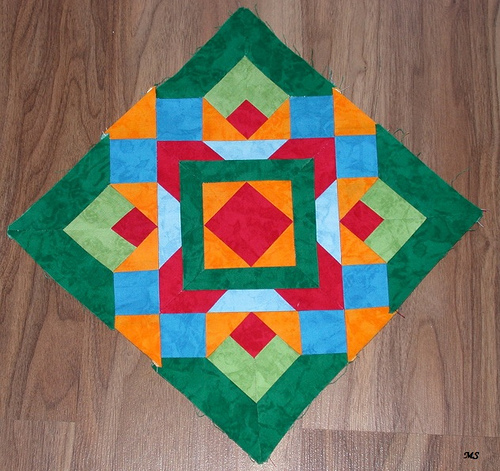 And of course, Brenda Weien's quilting is fabulous! Thanks for checking out my new block of the month and my new publications!